18. 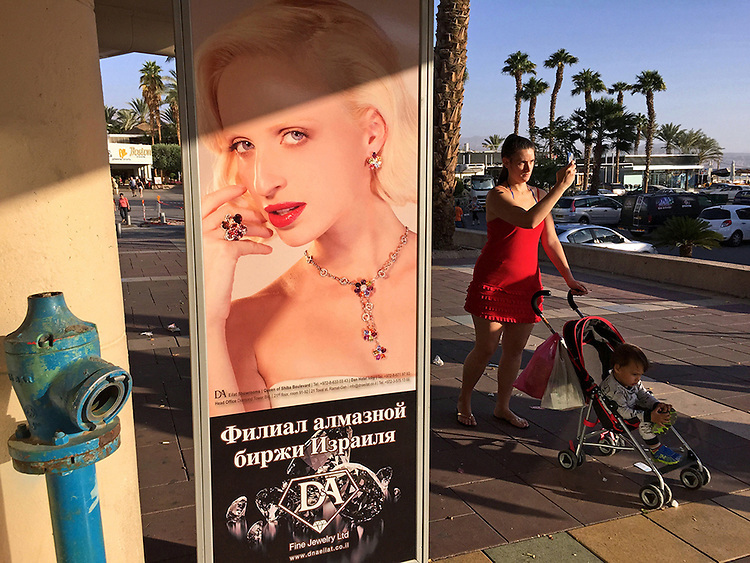 "Woman on Cell Phone": with baby in tow, walking past Russian diamond advert, Eilat. A blue-green industrial looking pipe makes a strange contrast to the contrived elegance of the blonde Russian woman bedecked with jewelry in the diamond ad. So too does the woman on the cell phone contrast, pushing her baby in the stroller through this shopping district in Eilat. Although she wears a red dress baring her chest and shoulders like the model, she is scarcely as seductive as the blonde. In fact, she seems quite matronly, absorbed in her own self, and paying no attention to me or her child. There are many Russian immigrants and visitors who frequent Israel. They flock to Eilat as well as the Dead Sea, as evidenced in this and next photograph.